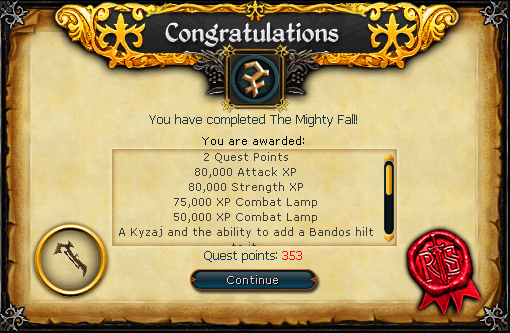 The Mighty Fall quest continues the Dorgeshunn storyline alongside the new sixth-age story, involving the death of Bandos. Featuring Zanik, General Graador, not Big Sean, a fancy new weapon called the Kyzaj, references to popular sayings, laughs, and that high-pitched, oh so very controversial little goblin who no matter how hard I punched in the face, never gave me a Lucky Armadyl Godsword. Let's roll. You kill Dad dad. Dad eat Dad dad. Now name Dad. After the death of Bandos, the Bandosian forces are in disbelief as to how the Big High War God could be defeated by the puny Armadyl. 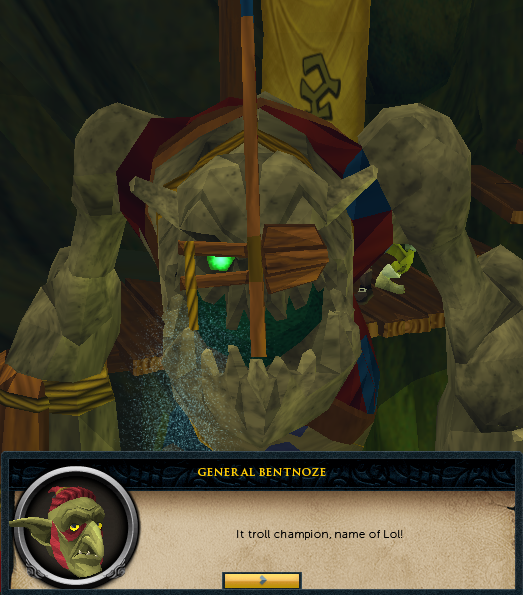 General Graardor has led the army of Bandos to Dorgesh-Kaan looking for revenge against Zanik and the Cave Goblins as he is blaming them for his death. Will you help the Cave Goblins to save their city by taking part in a tournament, and in doing so determine the new leader of the Bandosian forces? Note: This quest features difficult combat, and dying during any of the rounds will result in your items being dropped under a gravestone near the Yu'buisk portal and you respawning in Falador. To begin the quest, speak to Ur-tag the cave goblin, who can be found upstairs at the very north of the Dorgesh-kaan city. The easiest way to get there is with a Dorgesh-kaan moving-over-distance sphere - if you don't have one of these, you can always follow Kazgar through the Lumbridge caves, or use the Fairy Ring network to Yu'biusk, go to the Bandosian Throne Room, and enter Dorgesh-kaan through there. Ur-tag will tell you that scouts have given him reports of an Army marching on the Dorgesh-kaan (I did no such thing, but whatever). 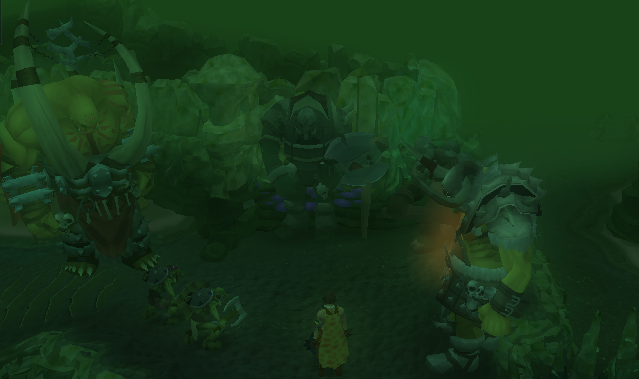 Zanik will appear, and will ask you to try and hold them off by entering the Lumbridge swamp caves and speaking to them from there. The shortcut from the Lumbridge Cellar has been blocked off by the Cave Goblins in an attempt to defend themselves, so you'll need to go around. You'll need a light source for this. 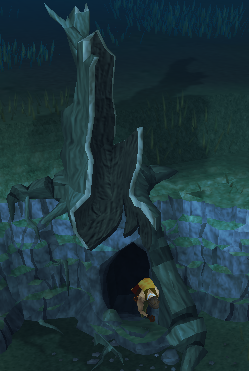 Go to the Lumbridge Swamp, and enter the hole in the tree. Run east and you will encounter a number of very important figures. How many Bandosian creatures does it take to start a life-threatening argument to all those around? Just two. So imagine how bad it is when there are five. Here you'll encounter General Graardor (who recognises you), Bork, General Bentnoze and Wartface, Dad, and a new Ourg by the name of Zarador. Through various humorous and frustrating conversations, the Bandosians will tell you of their plans to kill Zanik, however it quickly (predictably) spirals into an argument of who is the strongest and could smash everyone else. 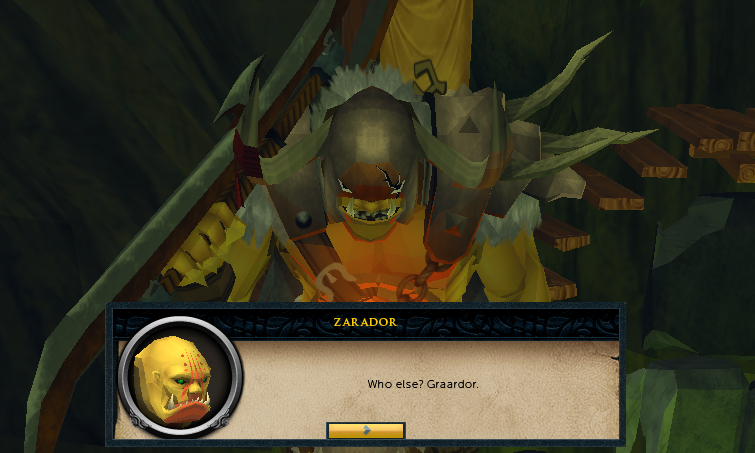 Graardor, of course, claims to be the one, and you use this to your advantage - what happens next is that Graardor calls a Kyzaj, an ancient Bandosian ritual, which is essentially gladiatorial combat. You will represent the Dorgeshuun tribe, however you will act as Zanik's "trained animal" as this is the only way you may fight in accordance with the rules. This distracts them from their initial goal of killing Zanik, but Zarador knows what you're up to - he's slyer than most Ourgs. In spite of this, he agrees to the combat. Return to Ur-tag and tell him the news. 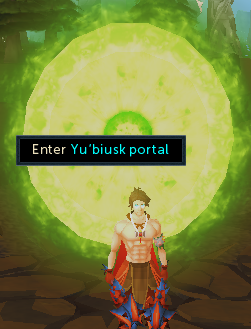 Zanik will then tell you to meet her at the portal that has opened up to Yu'biusk, which appears at the death scene of Bandos - just east of the Goblin Village, north of Falador. Meet her there. When you meet Zanik at the portal, she tells you some startling news. When Bandos brought her back to life (remember when you did Death to the Dorgeshuun all those years ago?) she was connected to Bandos's lifeline. With that in mind, it is imperative you don't lose the tournament for her! The rules state that if you die, her life is forfeit, and if she dies, so is yours. She'll wish you good luck, and from there take the portal to Yu'biusk. Upon entering the plane, you'll have to locate Zarador. Yu'biusk might be a bit confusing, but you'll find him if you take one ladder up and then make your way west around a cliff. Zarador should be near a bank area. He will tell you the rules of the Kyzaj, which are pretty simple - no Summoning, and abide by the set handicap of each battle. He will them instruct you to find your camp , which is inconveniently placed far south down a bunch of ladders. When you get there, you'll find your best friend Burntmeat there, alongside My Arm and Grubfoot. They say they are here to cheer for you, and Burntmeat will then offer you his latest delicacy. It's up to you to take the risk. 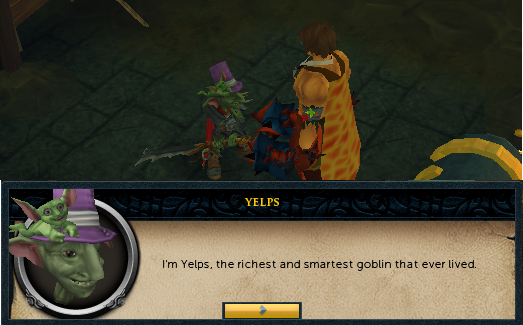 A Goblin sent by Zarador will arrive shortly after with the message about your first fight - you will be facing off against Yelps. However, this goblin seems highly suspicious - it has a funny accent, calls Bandos by his name, instead of "Big High War God" among others, and it turns out to be a human Bandosian in disguise, who will then attack you. He has low life points so finishing him off won't be a problem. He will drop a note on death, which tells of plans to poison all the Bandosian generals as revenge for excluding humans (under regular circumstances, which is the only reason you're here) from the tournament. The note also states that there are five more humans around the tournament that you must defeat. Run to Zarador, who will ask you to dispatch the humans. Find and kill them all, and return to Zarador, who will ask you to prepare for your first fight against Yelps. You'll want your best armour, weapons, and food. You cannot use any summoning during any of the fights. The special rule for the first battle is that you may bring as many Goblin minions as you want, but as the Kyzaj does not care in the slightest for your lack of said minions, this has no effect on you. Begin the battle at Zarador. You will be placed in the arena alongside Yelps and two bodyguards. Yelps has a daunting 200,000 Lifepoints, and a very irritating special attack where he spins rapid circles with his Lucky Bandos Godsword, and is deadly should you have the misfortune to land yourself within it. He will yell "WOOOHOOOO, EXTRA SPIN FOR THE WIN!" before using his special attack, so get ready when you see this. For this battle, you must dispatch of Yelps' bodyguards before you can deal any proper damage to him, as you'll only hit about 10% damage if they are alive. However, once they're dead, you can hit him for over triple damage, with a damage cap of 10,000. As you hit triple damage, using soul split would be helpful. He will spawn more bodyguards throughout the fight, so make sure to kill those immediately. Once you have killed Yelps (woo! ), you must go and speak to Zanik. You'll chat for a bit, and then return to Zarador to begin your second fight. This time, your opponent is a troll called "Lol" (as named by "Power to the Players!"). The handicap for this battle is much more serious - you are not permitted to wear armour. Pray against Ranged for this fight, as it is the only defence you will have. Lol's special attacks include throwing rocks like the Troll Rangers from Troll Invasion, except more constantly and you have less space to run. Once he's thrown 4 or 5 rocks, they will begin to glow red, and explode for a very high amount of damage. The trick to this fight is to land all the rocks on one side of the arena, so you are able to run clear of them as they begin to explode. For this fight, bring as much food as you possibly can. Don't waste space on Prayer potions either, as prayers are disabled during the battle. This fight is one of endurance; you must dodge Graardor's constant sweeping attacks (simply by moving two squares) that can hit 40% of your maximum lifepoints if undodged and his unavoidable slam attacks (which you shouldn't try to contain). Do not wear any life point boosting armor, as these will only increase the damage taken by Graador's specials. Watch out with your use of abilities - even slice can hold you still long enough to get you hit by Graador's sweeping attack. With his sweeping attack, Graador can destroy part of the platform. If you see a text warning of this, get off the edges of the platform immediately. Graador will also have a stomp attack that he will use if you run under him, so do not run under him to avoid his swipe attacks. Dodge the attacks and chip away at his health. A good tactic is to build your adrenaline to full, wait until Graardor does a sweeping attack, and then use the abilities Berserk -> Sever -> Sacrifice -> Kick/Backhand, and then your general ability rotation once more. If you get enough Adrenaline for a Threshold, use Hurricane - Assault and Quake can hold you in place too long, and you could get killed. If you die, your grave appears at the portal and your respawn hub will be Falador. You are then given a choice; if you kill her, you will become a true Bandosian in the eyes of all assembled, or spare her, and she becomes the leader of the Bandosians. The life of your first quest companion, and the most adventurous, daring Cave Goblin you ever had the fortune to meet is in your hands. 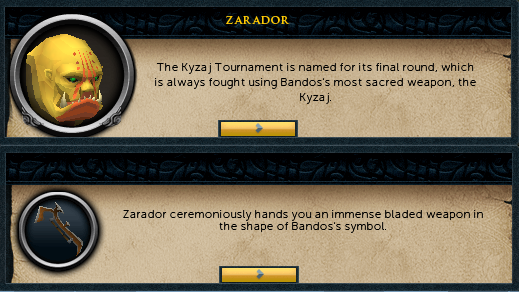 Regardless of your choice, you will be sent by Zarador to Dorgesh-kaan afterwards, with his thanks on the tournament. Travel there, and speak to Ur-tag. Congratulations, Quest Complete! The Kyzaj is a decent weapon, having level 70 stats, but can be upgraded to a tier 75 weapon by adding a Bandos Hilt to it (Becoming the "Superior Honourable/Bloodied Kyzaj, depending on your quest options). The hilt can be removed at any time, just like a Godsword. If you wish to swap the Kyzaj from Honourable to Superior, speak to Zarador at Yu'biusk - he's were you left him. If you die and lose your Kyzaj, you may reclaim it from Zarador for 100,000 coins. If you chose to spare Yelps, you will have these items sent to your bank: "Yelps' own cash bag", and an "Expired Spin Ticket". If you did not spare Yelps, you can obtain them from his camp on Yu'biusk. When opened, Yelp's cash bag contains 73,105 coins, and the Expired Spin Ticket is currently of no use whatsoever. Around Yu'biusk, 14 Bandosian Chronicles are scattered. Each one will add some more lore to your Bandosian Memories book, and collecting all 14 is a requirement for the Completionist Cape.